The Sydney Morning Herald's post vote polling showed the most important statistic IMO: "More than half of No voters said fear for the future was the most important factor affecting their vote, while 80 per cent of Yes voters said they voted because they were hopeful for the future." So 'project fear' worked, again. 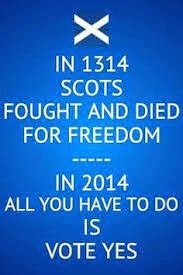 Many fearful and older Scots were afraid of how an independent Scotland might change their lives. The ‘No’ campaign’s slogan ‘Why take the risk?’ played a big part in fostering this view. ‘Yes’ campaigners say ‘project fear’ was a unconcealed effort by the British establishment to win at any cost. In the end i'm grateful to have had nearly a full day of mystery where the future might have changed, where a crack in the Wall St, wall may have appeared. It felt good. From the look on the faces of so many young Scots it won't be the last vote they have. Is September 18th Scottish Independence Day? Excitement Mounts Across Scotland. There's 2 hours to go before the polls close in Scotland and Vancouverite, Jackie DeRoo, a self confessed "Democracy Tourist" has been in the midst of the madness that is Scotland these last few days. Spontaneous marches like the one above to Scottish parliament last night are erupting all around her, Jackie says she's "witnessing the biggest commonwealth event in 100 years." Checking out the Scottish independence referendum LIVE UPDATES in between chores, there's some neat pictures and other stuff. 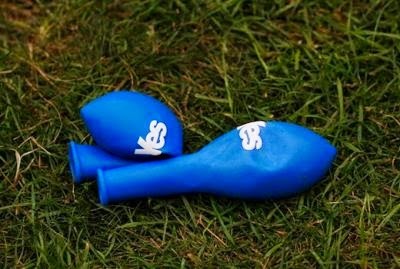 But from what i can gather from across the timezones is that the AYEs believe they've won [though i'm sure the Unionists are skulking around thinking they've won as well]. 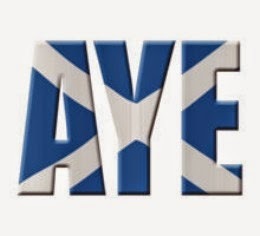 Time will tell but emotionally the AYEs have it by far in Scotland today. Living here in Canada i realize how wrong the pollsters have been recently. The 'gold standard' for political polling has been telephone polls for decades, that's what pollsters are trained to do, what the media is trained to report. But the younger generations, the cell phone loving, social media addicted folks don't have home phones and the poor don't even have homes let alone any kind of phone. The pollsters are looking through old scratched glasses and the old demographic does favor the Unionist side because the older folks are the more they feel they have to protect the stuff they've earned through a lifetime of work. Very valid, for them, but not of those less enfranchised. Everyday folks everywhere understand that anything the banks, corporations and politicians are so unanimously against can't be all bad. In a few hours the polls will open in Scotland. 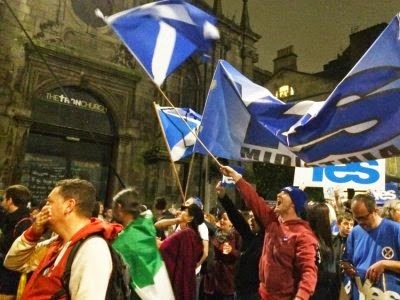 The Scottish are on the brink of perhaps changing the course of world history. Watching it unfold from Canada, where twice i saw how the elites made hollow promises in advance of the Quebec referendums, and twice saw those promises evaporate, it's 'like deja-vu all over again'. Take heart supporters of liberty in Scotland in the last 150+ years 50 independence votes like yours have taken place, the score is 44- YES only 6-NO [including the two i watched here in Canada]. 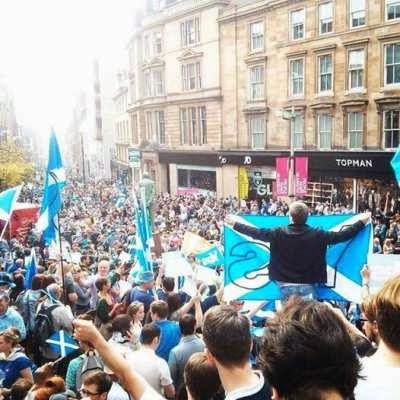 An AYE in Scotland over the next hours won't in itself cave in or cripple the elites, but their momentum toward liberty creates domino effect the minds of other dreamers, other liberty lovers. 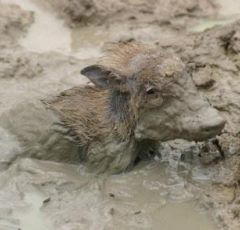 The Catalans are watching in droves, billions of others are watching silently. There must be a crack in the Wall St. wall somewhere, let's hope it's AYE Scotland today, everywhere soon.